What I have found travelling the highways and back roads of Oregon is that it normally isn’t about the big attractions with websites and marketing people, but the spots you discover on your own, that are the most rewarding. The Lowell Bridge was one of those discoveries. Driving back from a Central Oregon trip to my home in Newberg, I came across a covered bridge along Highway 58 outside of Eugene. If the truth be told, we were looking for a place to stop to rest our legs after spending the day in the car. I saw the park sign along Dexter Lake and knew that if nothing else, I would have a nice view during my walk and bathroom stop. What I found was not only a walk, but a very informative covered bridge that was a self-guided tour on the importance of the waterways and crossings in the area. The bridge sits along Pioneer Street and is no longer used to carry traffic, like it did when it was first built in 1907. There is a dock-like structure that leads out to the bridge, and along the pier are interpretive signs that give you dates with facts about the bridge and other covered bridges around Oregon. For example, one of the signs says that in 1975 the Ritner Creek Bridge was relocated and then rehabilitated in 2006. The Lowell Bridge is part of the Oregon Covered Bridge Program which was developed in 1989 by the state to preserve as many of the covered bridges as possible in Oregon. What I learned, just from a leisurely stroll down the pier is that in 1907 the bridge was constructed by Nels Roney and a crew of eight men, which is extraordinary when you consider the size and scope of the bridge – and how big of a crew it would take to construct something like it today. The bridge was built to bypass an expensive ferry to cross the Willamette River – the route was a main passageway for settlers and supplies to reach the Willamette Valley at the turn of the 20th Century. This bridge, while new, was part of a larger project Roney was working on to rebuild many of the covered spans that were destroyed by heavy snow and statewide flooding during the thaw in 1861. Later the bridge was rebuilt in 1945 after a dam was put in to create the reservoir. History aside – I want to leave some of the story for you to discover when you visit the bridge – walking down the pier to the actual rebuilt bridge, is an education and you can see the birds, fish and other wildlife that are along the Willamette River. Once you get into the bridge itself, there are large, backlit display boards that tell the more detailed story of Roney, the bridge, the local economy and even about the maintenance on the bridge over the years. One of the displays even has a small model with a section of the outside of the bridge cut-away so you can see how the structure was designed. Much like the Ritner Creek Bridge, the Lowell Bridge was also rehabilitated in 2006, but the majority of the structural components from 1945 were still used. While the bridge doesn’t have to hold traffic anymore, the structure is very stout, and even looking at the planks and flooring you can tell it will stand the test of time. One of the things I enjoyed most about this short stop, was that the state had also made a small interpretive center outdoors, that is the same style as inside the bridge itself. Those panels talk about the settlers, the river and Lowell. It sits right on the edge of the Willamette, where on one side you can see the dam, and on the other there are park benches. The park is low enough to the river were you can see fishermen taking advantage of the nice access. So if you are travelling between the Willamette Valley and Central Oregon, the Lowell Covered Bridge is a nice outdoor way to learn about history, get a good walk in and maybe even do some bird watching or fishing if that interests you. About the Lowell Covered Bridge: The Lowell Covered Bridge is a bridge crossing the Willamette River outside of Lowell, Oregon. The original bridge was built in 1907 and it was rebuilt in 1945, and rehabilitated in 2006. 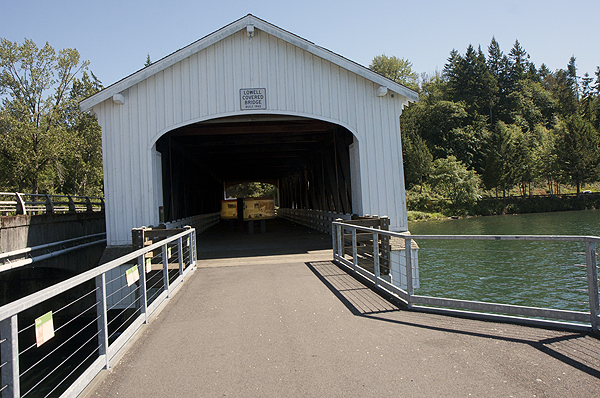 It currently is a self-guided interpretive center that gives visitors the history of covered bridges in Oregon. The bridge is 165 feet long and clears the water by two feet. What to bring: While the bridge is covered, the majority of the park is outdoors. It is also in the Willamette Valley, so make sure to wear weather appropriate clothing. While the summer is nice, expect rain during the other three seasons. In addition, the planks and boards on the bridge are slightly uneven, but are handicap accessible, but you may want to wear flat shoes for the best comfort. Tip: As someone who likes to bird watch (but I wouldn’t call myself an expert), the bridge is home to several nests of swallows. Make sure to look up and see not only the birds flying in and out of the inside of the bridge, but also the truss work that went into constructing this bridge. It is impressive. Season: The bridge is open year-round. Getting there: The bridge is approximately 13 ½ miles east of Goshen, Oregon on highway 58. There is an exit on Interstate 5 south of Eugene/Springfield for Highway 58 to Central Oregon. The bridge originally was the crossing for Pioneer Street, and that street still runs parallel to the old bridge.